Peterborough Islanders shut out Lee Valley Lions 16-0 in the South 2 East Conference on Sunday in a game that saw them outshoot the visitors 96 to 7! Bradley Moore hit 3+3 and Shaun Yardley 2+4 as the Islanders tore into the short benched Lions who only had 10 skaters and one netminder with them. Peterborough forward Leon Groom went in goal for the 3rd period and kept out all three shots that he faced. 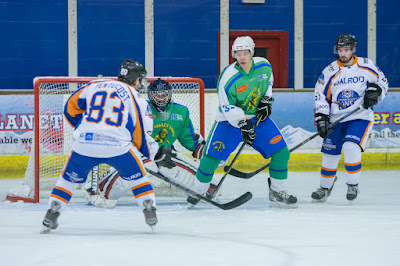 As a result of this victory, the Islanders move up to second in the table, level on points with both leaders Chelmsford Warriors and Slough Jets.